Don't you wish your Mac Pro's four internal drive bays were 6Gbps rated? Are you hoping the "mythical" 2013 Mac Pro will sport 6Gbps rated drive bays? Well, just in case it does NOT or in case you plan to keep your 'pre 2013' Mac Pro a little longer, FirmTek has a product to give you hope. They just released the SeriTek/Q6G, a 4 port 6Gb/s eSATA storage adapter than can enable you to benefit from 6Gbps speed for a mere $199. And it boots OS X! In our test session, we added a twist. We connected a 5-bay Port Multiplier enclosure with HDDs and a two bay notebook enclosure with 6G SSDs. We ran benchmarks on both at the same time. Think of it as bandwidth sharing. I can picture the wheels turning in your head, but first take a look at the test results. Notice that the top and middle graph entry are the combined results of the PM5 and the miniSwap as we were running the test on both simultaneously using two copies of the benchmark app. All test scenarios were done on the 2012 Mac Pro 3.33GHz 6-core Westmere running OS X Mountain Lion 10.8.2 with the SeriTek/Q6G in slot 2. RAID 0 sets were created using Apple's Disk Utility's RAID function. 1. 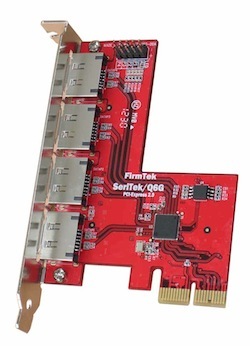 The FirmTek SeriTek/Q6G squeezes the full 500+MB/s speed from a single 6Gbps SSD. 2. There's little to be gained by striping more than two 6Gbps SSDs since the maximum throughput we observed was 778MB/s (QuickBench). If you are looking to go faster, you'll need a pricier host adapter -- that may not boot OS X. 3. Did we mention that SeriTek/Q6G can boot OS X? I'm often asked about booting from a single or pair of 6G SSDs. This is your answer. 4. We played "mix and match" by connecting the SeriTek/PM5 Port-Multiplier 5 bay enclosure using only one port and the miniSwap using two ports. We still had one to spare. The idea was to illustrate versatility and to show how the bandwidth of the Q6G hand handle both -- at the same time. We could have connected another PM5 for a total of ten drives. Or use all four ports for PM enclosures and have TWENTY drives. The main downside of port multiplication is the speed which is limited by a single 3Gbps port in each PM enclosure. There are many eSATA enclosures from which to choose. We used the miniSwap/ES for two reasons. First it is fast with two dedicated 6Gbps rated eSATA ports -- one for each of the two notebook drives. The second reason is convenience. Pop the two doors open, slide in your 2.5" drive, and rock'n'roll. That's not all. It's quiet with no fans -- uses passive convection cooling. Though our test SSDs were 9mm thick, it can accept drives from 7mm to 14.9mm thickness. And it just happens to fit under the handles of a Mac Pro. If you are going with Port-Multiplication, FirmTek makes the SeriTek/PM5 with five bays, the enclosure we used in testing. Our favorite feature is the fact that the drives plug directly into the backplane. No internal cables "competing" with the external one. The FirmTek SeriTek/Q6G is an affordable, versatile, and high performing storage adapter that you can use to enhance and extend the life of your "pre 2013" Mac Pro. If you buy the SeriTek/Q6G 6G storage adapter for your Mac Pro and decide to trade it for a Mac that has Thunderbolt, you can still use it! What? Yes, FirmTek will soon release a compact Thunderbolt expansion device. You simply plug the Q6G into the device and connect whatever eSATA drive enclosures you were using with your Mac Pro. Only now they are running through Thunderbolt. Of course, you can also use the Q6G in existing Thunderbolt expansion boxes like the Helios and ExpressBox 3T, but stay tuned for details on the unique FirmTek take on this. Order it direct from the FirmTek online store. Bundle it with a miniSwap/ES or the SeriTek/5PM enclosures to save $$$.